Acrylic is one of the toughest materials we sell. It is often used as an alternative to glass. Also referred to as Perspex, it is the perfect choice when you want a sophisticated, high end look. View our full range of acrylic signs for more ideas. It has a high tech, sophisticated look and is a good alternative to glass as it is less dense and a lighter weight. Acrylic is also very durable and has a smooth surface, making it ideal for high quality graphic reproduction. The only downside is that it can scratch over time and can shatter and chip upon impact. 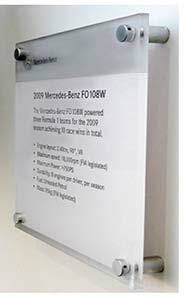 Acrylic signs are ideal for indoor or outdoor, long term applications, where image is a crucial factor. They can be used to great effect in offices, receptions and showrooms. We don’t advise using Acrylic signs in high traffic areas where they may get scratched or knocked onto the floor. Perspex can be printed direct to the panel or onto a high quality, self adhesive vinyl, which is then applied to the panel. The preferred print method depends on the image that is going to be printed and where the sign will be used. Our team will advise on the best print method for your job. Perspex Acrylic can be drilled into and is often used with sign stand-offs to create a modern look. It can also be screwed, attached using double sided tape or glued to a suitable surface. Acrylic signs can be contour cut for an additional fee. Most popular thickness for Acrylic signs are 3mm or 5mm,but it is available up to 25mm thick for special signage projects. Clear acrylic sheet is held in stock, while opal, frosted and coloured Acrylic sheets are available to order. Acrylic sheeting achieves a UK Class 3 fire rating. Yes, it can be recycled. or call 0844 800 1020.